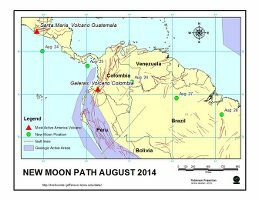 This is the path of the New Moon in August 2014.
the pass is over warm water. Last edited by gigabite on Mon Dec 31, 2018 9:59 pm, edited 10 times in total. 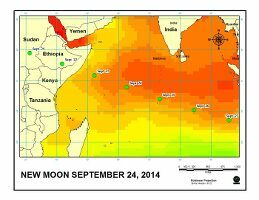 I look at the deformation of tropical storms at the pass of the New Moon. 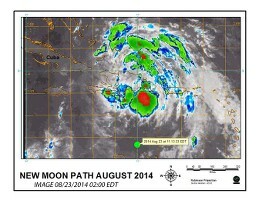 big red blob on the 2:00 am edt image is about 18° and the Moons latitude is 13°. Maybe a 3 millibar rise in barometric pressure. I'll look at again this-afternoon. from over water to over land. 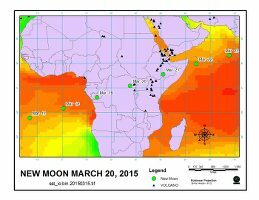 The Area of Interest (AOI) is the chart area. the October Full Moon, but still extreme. subject to some accelerated evaporation. 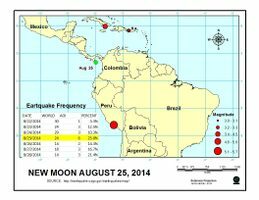 a recent history of magnitude 5 earthquakes. What does accelerated evaporation mean? 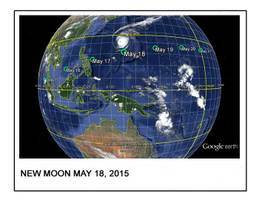 Does this promote more tropical cyclone activity? I know that this maybe causes earthquakes. Does it? I will begin this reply with a caution statement. The Earth is a small blue dot in the solar system, and any direct alignment of bodies that pass through the Earth are very rare. 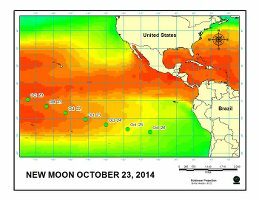 These positions plotted in this study of global moisture are a plot of the Moon’s position when the Sun and Moon are in the same degree near the New Moon. I don’t adjust for the difference between the latitude of the Sun and Moon. 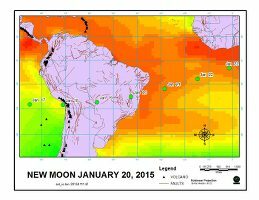 The purpose of this study is to observe how global water vapor coverage changes relative to the position of the New Moon. Accelerated Gravity is a point in the evaporation process when a molecule is on the threshold of the state change, and it is struck by a graviton causing it to be lifted from the surface of the water body more quickly. 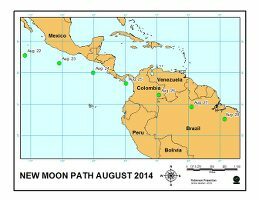 The early studies of the New Moon Path seem to show that Tropical Systems have a large enough mass to be influenced by the gravity well. This gravity well moves in the opposite direction of the tidal bulge. The gravity well is directly below the Moon, and the Earth atmosphere rotates a thousand miles an hour through it. Visualize a single pier in a strong flow. Eddies will form, and dissipate. 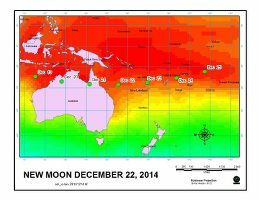 The presents of a mass of water vapor is a key element, and the latitude of the moon needs to be south of it, or in the Southern Hemisphere the moons latitude would need to be north of it. The tidal bulge deforms the Earth on a regular basis. 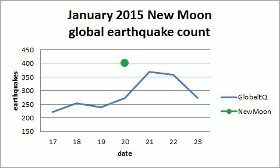 The presence of the New Moon does not normally change the frequency of earthquakes, but as the earth/moon distance gets beyond 356800 kilometers in an apogeal swing, global earthquake frequency tends to increase. This is a measure of water vapor over the year. 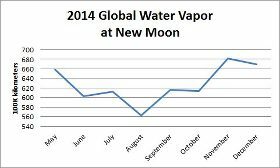 describe the water vapor over time. 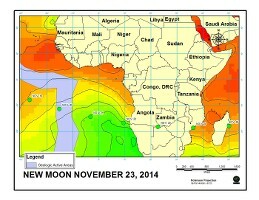 The New Moon passing from water onto land. volcanoes and fault lines in the area. This is another pass over Australia. Very similar to December 2014. Rift Valley into the warm Arabian Sea. persists until April 18, 2015. Last edited by gigabite on Fri Jun 12, 2015 8:02 pm, edited 1 time in total. but the current frequency count is low. Is this responsible for the hyperactive activity with back to back cat 5's? euro6208 wrote: Is this responsible for the hyperactive activity with back to back cat 5's? 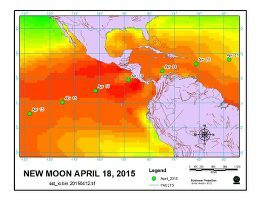 Dolphin went from a major hurricane to a strong gust over the 7 days of the phase. 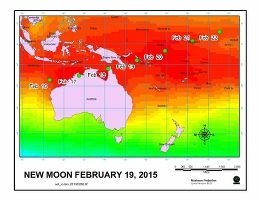 There could be a relationship to the temperature of equatorial waters, and the range of the New Moon's latitude.